Within the world of medieval warfare, there were multiple kinds of siege weapons: ballistas, battering rams, trebuchets, and catapults. ‘Catapult’ can be used as a more general term for all throwing siege weapons: “Catapults are siege engines using an arm to hurl a projectile a great distance. Any machine that hurls an object can be considered a catapult, but the term is generally understood to mean medieval siege weapons. The name is derived from the Greek ‘to hurl a missle’. Originally, “catapult” referred to a stone-thrower, while “ballista” referred to a dart-thrower, but the two terms swapped meaning sometime in the fourth century AD. 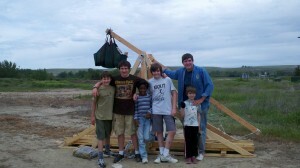 My son has built a trebuchet for his senior project. He’s the tall one in the picture, with assorted brothers and cousins. Battering Ram: “The concept behind the battering ram is simple – momentum coupled with mass. In other words, take a heavy object and hurl it repeatedly at a stationary object, such as a door or gate, to break through the object. Typically a large tree would be felled and the branches removed to allow those that remained to be used as grips. A group of soldiers would lift the tree trunk and, after a running start to build momentum, ram the trunk into whatever they wanted to break through, generally a castle gate. If this was done enough times, the door would break open. Trebuchet: “Trebuchets were used to throw stones–or dead animals–with great accuracy. A trebuchet was capable of launching 200lb. projectiles towards virtually anything. We can define a trebuchet as “the atom bomb of its time.” Earlier trebuchets could only fire small stones or even cows. 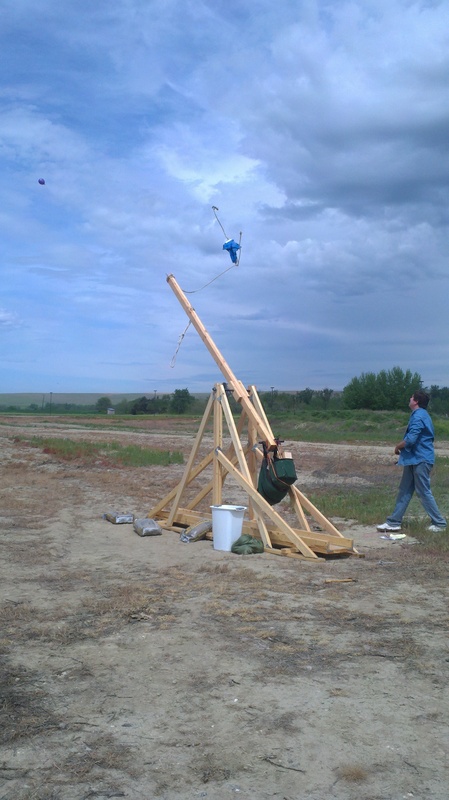 As time passed and as trebuchets were improved (Leonardo Da Vinci dramatically improved them) they were able to launch huge projectiles towards a castle’s walls. Many persons were needed to operate a trebuchet. Trial-and-error was the method used to destroy a wall. When a certain point of a castle was targeted, the trebuchet was so accurate that it could remain firing almost invariantly at that same spot; making them very effective. With trebuchets, invading armies could fire cows and other dead animals from a relatively large distance. The only downside of trebuchets was their enormous size. In earlier medieval times, it was very hard to transport such gigantic machinery. As they were improved, new methods to arm them were discovered.” http://www.medieval-castles.org/index.php/medieval_trebuchet The picture shows Carew firing a water balloon. The video below shows the trial and error involved in getting it right. As it turned out, it wasn’t launching the water balloons far at first because the rope on the sling was too long and the angle of the ‘finger’ at the end (onto which the rope was hooked) was angled too sharply. ← Previous Previous post: If you were David, a time-traveling Prince of Wales . . .